About to Break is a weekly podcast featuring conversations with incredible artists and entertainers discussing the highs and lows of life in the biz. Listen in as we discuss the challenges of trying to break into the industry before the industry breaks us. 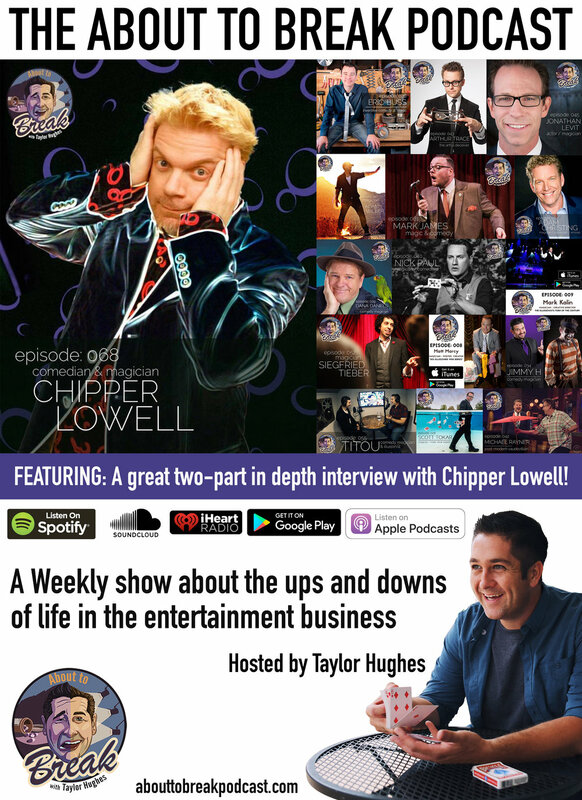 Taylor Hughes is a Los Angeles based magician, storyteller and the host of the weekly About to Break podcast. Taylor was a featured act on the television series “Masters of Illusion” and was recently presented the awards for “Best Illusion” “Best Comedy Magic” & “Best Showmanship” by the Society of American Magician’s in Los Angeles. A popular guest speaker, entertainer, and emcee for corporate organizations. Taylor brings his years of performing experience to the podcast. Here is a video of some of our incredible guests!